KNOXVILLE, TN – Mold Testing. It sounds serious – and expensive. No one wants mold in their house, but sometimes it’s better to just ignore it, right? I think you know the answer to that. Ignoring a problem only makes it worse and more expensive in the long run. Having a professional mold test done is probably less expensive than you think, and if you do have mold, the clean up can be less expensive when you deal with it early on. Ignorance is not bliss. Tennessee has seen a tremendous amount of rain over the past few months, making mold more of a problem than it is normally. Mold needs water, air, and food to grow, and when there is an abundance of water, it grows very quickly. Moisture under your house, in the basement, in the attic, or some other place in your home is a great place to grow unwanted mold. Toxic mold is known to cause numerous health problems in a percentage of the population. If you or your pets are allergic to mold spores, they can wreak havoc on your health. Mold in a home basement or crawlspace can make the residents of that house ill, even after a short exposure. Symptoms include, runny nose, headaches, skin rashes, and itchy eyes, just to name a few. Mold can also cause asthma attacks and infections of the nose, throat, and lungs. If you have any of these symptoms, see your doctor, then call us for a professional mold test. Mold may be the reason you are sick. Mold can cause physical damage to a home. Mold eats organic materials like wood (yes, the kind of wood in the crawlspace supporting your house). Over time, mold eats the wood supporting the house, causing it to become unsafe. Do not underestimate the damage mold can do to a home. We have seen our share of homes with rotted floor joists in the crawlspace. Crawlspaces often have perfect conditions for growing mold. They have plenty of wood, air, and during rainy seasons, plenty of moisture. Crawlspaces without an encapsulation system in place are especially susceptible to moisture and mold. If you have had a leaking roof, mold could be a problem in your attic as well. Remember, mold can grow anywhere you have organic material, oxygen, and moisture. If you suspect that mold is growing in your home, basement, or crawlspace, you owe it to yourself, your family, and your friends, to have it checked out. The process is fairly simple. 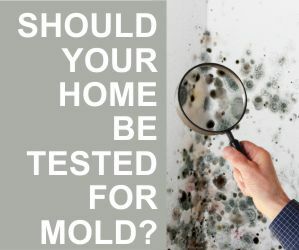 A trained and certified mold inspector will take samples of the air inside and outside your home. Then he will take specimens from any surface area where he suspects mold is growing. Surface specimens are taken using a cotton swab or tape. After the visual inspection is completed, all the collected specimens are delivered to a lab for analysis. Under normal circumstances, the lab will send the results back to us within 24 hours. 1st Choice Home Inspections’ licensed, trained, and certified inspectors are available six days a week for unbiased mold testing. Please call us in Nashville at (615) 538-7707 or in Knoxville at (865) 938-7575 to schedule an appointment to have your home tested for mold. 1st Choice Home Inspections charges $350 for the first three samples and $75 for each additional sample needed. This price includes the lab fees.